A look at embedded systems and what it takes to build one. An experiment and experience in using Linux in an embedded application. A scientific laboratory in Europe depends on Linux for controlling equipment used in their research. A quick look at what to look for in a laptop for Linux and how to set it up. Mr. Knudsen tells us why this company chose to add MS extensions to Kaffe, the Open Source Java implementation. Side Effects Software pulls the Linux penguin out of its hat with a port of Houdini. A continuation of the discussion on creating graphics dynamically on the Web. How a bank in Argentina is using Linux for testing database and web applications. Designing a new library for processing of large images using a minimal amount of memory. Web site monitoring of your system can be easy using Linux and Perl. 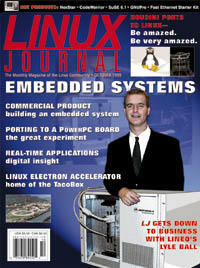 Mr. Curley takes a look at two open-source solutions for embedded systems: RTLinux and eCOS from Cygnus.